29 Jesus answered and said unto them, Ye do err, not knowing the scriptures, nor the power of God. 30 For in the resurrection they neither marry, nor are given in marriage, but are as . 8 And there were in the same country shepherds abiding in the field, keeping watch over their flock by night. 9 And, lo, the angel of the Lord came upon them, and the glory of the Lord shone round about them: and they were sore afraid. 10 And the angel said unto them, Fear not: for, behold, I bring you good tidings of great joy, which shall be to all people. 11 For unto you is born this day in the city of David a Saviour, which is Christ the Lord. 12 And this shall be a sign unto you; Ye shall find the babe wrapped in swaddling clothes, lying in a manger. 13 And suddenly there was with the angel a multitude of the heavenly host praising God, and saying, 14 Glory to God in the highest, and on earth peace, good will toward men. 15 And it came to pass, as the angels were gone away from them into heaven, the shepherds said one to another, Let us now go even unto Bethlehem, and see this thing which is come to pass, which the Lord hath made known unto us. Angels remained a presence from time to time during the life of the Savior, for instance, ministering to Him as He suffered the extraordinary pain of taking on our sins in the Garden of Gethsemane. In modern times, angels were the messengers who brought the restored gospel back to the earth. In the Book of Mormon, we read of Moroni, a prophet who was the last remaining righteous person in his personal world. He was a Nephite, as his people were known, and when his prophet father Mormon and the others of his people were killed, he inherited the records of his civilization. These records were sacred and would play a critical role in the restoration. They included details of the visit of Jesus Christ to the Americas after his crucifixion. Moroni abridged the records and buried them for safekeeping. After his death, he became an angel. 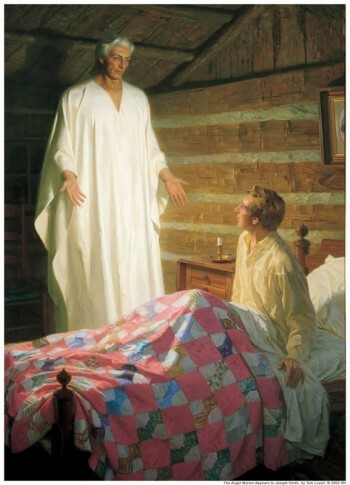 When it was time to restore the Savior’s full gospel to the earth, it was Moroni, fittingly, who came to earth as an angel to tutor Joseph Smith. When he felt Joseph was sufficiently matured and educated, he allowed Joseph to take the records from the hill where they’d been kept for safekeeping all these years. Later, as Joseph and his friend Oliver Cowdery were working on the translation of these records, which would become known as the Book of Mormon, they read about baptism. They had questions about this ordinance and went to the banks of the Susquehanna River to pray. At this time, John the Baptist came to earth as an angel. He had baptized Jesus, and still held the keys (the authority) of the Aaronic Priesthood, which is mentioned in the Old Testament. This priesthood is required in order to perform a baptism. He bestowed those keys on Joseph and Oliver, who were then able to baptize each other. There is an additional, higher priesthood called the Melchizedek Priesthood, which also needed to be restored in order for the church to function as it did in the days of the Savior’s ministry. These keys had also been taken from the earth after the death of the apostles, and again, angels came to deliver them to Joseph. The keys are not literal, physical keys, but are the authority to act for God. Peter, James, and John, who had been Jesus’ apostles during his mortal ministries, had received the keys to the Melchizedek priesthood from Jesus on the Mount of Transfiguration. They continued to hold them, since the world had been in apostasy, and so they came to bestow them on Joseph Smith and Oliver Cowdery. With all the keys now restored, the church itself could be restored. The work of angels is critical to God’s plan. They are frequently present when the most important events occur and are an important part of our lives on earth.